Sept. 11 Legacy: One Endless War Against Many Radical Enemies : Parallels The U.S. went to war after Sept. 11 and has now been fighting for 15 years, the longest unbroken period in its history. Despite disappointing results, there's broad consensus it should continue. 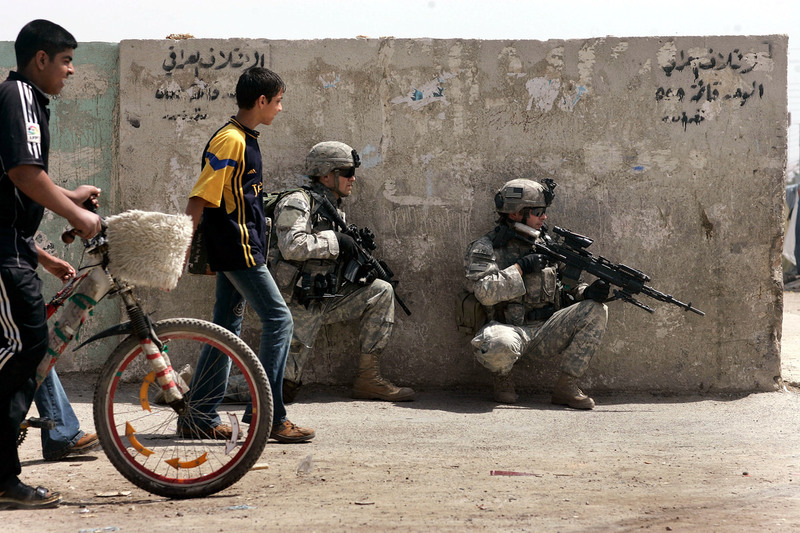 U.S. Army soldiers take up a position during a patrol in Baghdad in 2007. The U.S. has been waging war nonstop for 15 years since the Sept. 11 attacks. Despite the protracted conflicts and disappointing results, U.S. involvement in multiple wars appears set to continue for years to come. In the quarter-century from the end of the Vietnam War in the 1970s until Sept. 11, 2001, the United States rarely went to war, and when it did, the conflicts were so brief they were measured in days. The Gulf War in 1991 lasted 43 days. Airstrikes in the former Yugoslavia in 1995 went on for 22 days, followed by another round in 1999, that time for 78 days. But since the Sept. 11 attacks, the United States has been fighting every single day for 15 straight years, the longest unbroken period in American history. The U.S. has carried out airstrikes, sent in ground forces, or both, in seven countries stretching from Pakistan in the east to Libya in the west. None of these conflicts has been resolved, and all signs point to years of strife ahead. Sept. 11 has reshaped the U.S. in countless ways, but perhaps the most profound has been the transformation from a country where peacetime was the norm into one seemingly locked into a permanent state of war. Yet strangely, the country doesn't feel much like it's at war. "Like the war on drugs or the war on poverty, the war for the greater Middle East has become a permanent fixture in American life and is accepted as such," writes Andrew Bacevich, a retired Army colonel and professor at Boston University. America's overwhelming military strength has made victory look deceptively easy. Yet time and again, swift battlefield victories have been followed by frustrating setbacks. The U.S. greatly weakened al-Qaida in several countries, only to see the Islamic State emerge in others. 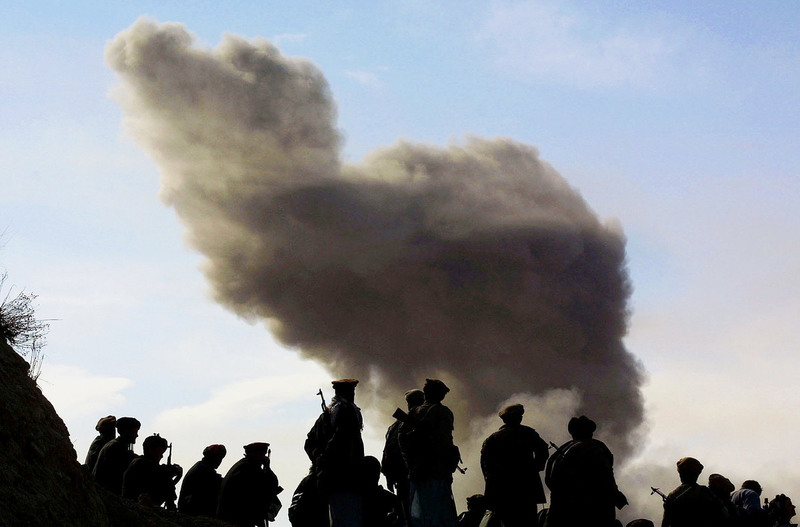 The Taliban were driven from power in Afghanistan, but regrouped as insurgents. Saddam Hussein was ousted in Iraq and Moammar Gadhafi in Libya, yet their dictatorial reigns were replaced by nasty civil wars in both countries. Nearly 7,000 U.S. military personnel have been killed and more than 50,000 wounded in these assorted conflicts. The financial tab is in the trillions. Many college-age Americans can barely recall a time when the country wasn't at war. 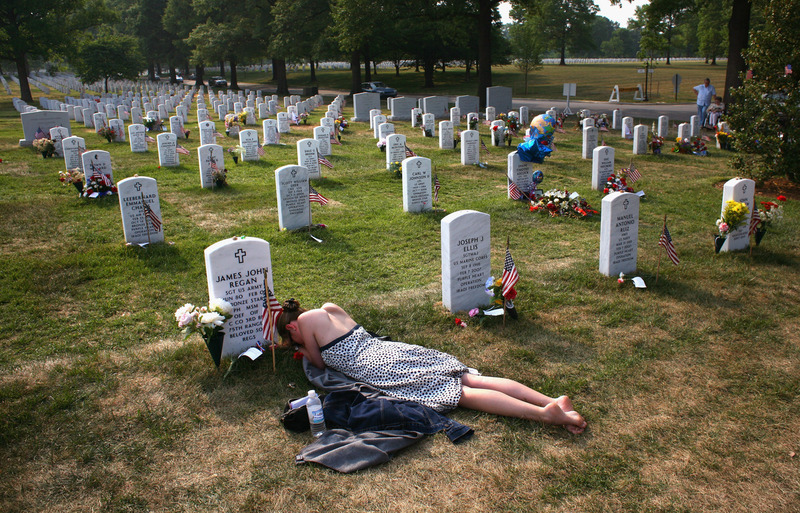 Mary McHugh mourns her slain fiance, Sgt. James Regan, at Arlington National Cemetery in 2007. Regan, a U.S. Army Ranger, was killed by a bomb in Iraq earlier that year. Nearly 7,000 U.S. military personnel have been killed and more than 50,000 wounded in the past 15 years of war. Despite the disappointing results, there's still a broad consensus among U.S. political and military leaders, including the two leading presidential candidates, that the battle against radical Islamist groups must continue — even if they can't say how and when these wars might end. But critics argue the U.S. has precious little to show for sustained involvement in a region that's going through a period of historic upheaval and, by most every measure, is worse off today than 15 years ago. And the longer the wars last, the less clear U.S. goals become, Rosa Brooks, a Georgetown University law professor who previously worked at the Pentagon, says in her new book, How Everything Became War and the Military Became Everything. "It has grown steadily more difficult to define our enemies," writes Brooks. "When you wage war against a nameless, stateless, formless enemy — an enemy with goals as uncertain as its methods — it's hard to see how that war can ever end." The U.S. has tried multiple approaches that, in general terms, have been large, medium and small. President George W. Bush went large, launching two major ground wars in Afghanistan and Iraq that proved far more costly and complicated than advertised. 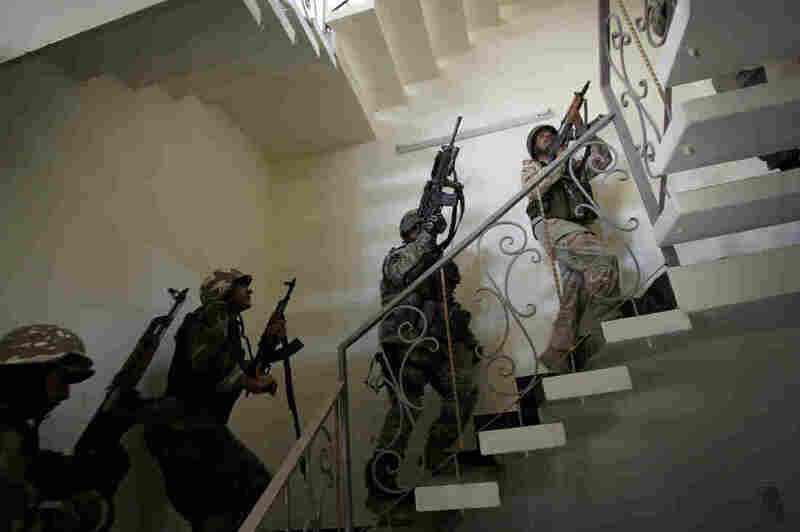 U.S. soldiers and Iraqi national police race up a staircase as they search a house in Baghdad in 2007. The U.S. surge in Iraq drove back Islamist radicals at that time. The gains were lost after the U.S. withdrew from Iraq in 2011, but the Americans have returned with an air campaign against the Islamic State. President Obama went small, pledging to wrap up American involvement in those two wars. He declared an end to U.S. combat operations in Iraq at the end of 2011, and in Afghanistan at the end of 2014. But with the rise of the Islamic State, U.S. forces are back to Iraq as part of a bombing campaign. Obama's original timetable for a full departure from Afghanistan has been delayed repeatedly. And after seeking to avoid direct involvement in Syria, the president announced a bombing campaign that's now 2 years old. As Obama's days in office wind down, the approach can now be described as the medium track. The U.S. is waging three wars, though on a much smaller scale than the two he inherited. "It's hard to argue that Obama's policies have been successful if you just look at where we are on the ground," Joby Warrick, a Washington Post reporter and the author of Black Flags: The Rise Of ISIS, told NPR's Morning Edition. "A lot of things that could have gone wrong have gone wrong in the Middle East under his watch." On a typical day, U.S. war planes strike in Syria, Iraq and Afghanistan, while relying on a relatively small number of U.S. forces to work with local forces on the ground. The U.S. now has fewer than 10,000 forces in Afghanistan, a bit more than 5,000 in Iraq and a few hundred in Syria. This has been politically palatable. Compared to ground wars, the costs and casualties are low. Republicans and some Democrats complain about the specifics, but there's no strong opposition. And Obama and his supporters can point to some progress. In Afghanistan, the country's army does the fighting on the ground and has kept the Taliban at bay, even if the radical Islamist group remains a potent and deadly force in many parts of the country. In Iraq, the Islamic State has been driven out of several cities and is increasingly vulnerable in the shrinking number of places it still controls, such as Mosul. In Syria, ISIS is also on the defensive, though it still holds large swaths of territory in a multi-sided war. Yet no one is forecasting a near-term resolution to any of these conflicts. This has saddled the U.S. with the burdens of war, yet offers little prospect of a clear success, argues Bacevich, the Boston University professor. "The United States chose neither to contain nor to crush, instead charting a course midway in between. In effect, it chose aggravation," Bacevich writes in his recent book, America's War For The Greater Middle East. The instrument of that aggravation: drones. In a word, this is why the U.S. has gravitated toward this type of limited warfare. The advance of drone technology and Obama's desire for a smaller U.S. footprint have merged into a policy designed to deliver powerful blows at minimal cost in dollars and lives. It's clear why this is an attractive option. A U.S. Predator drone flies over Kandahar Air Field, southern Afghanistan, on a moonlit night in 2010. The U.S. military has increasingly turned to drones in Syria, Iraq and Afghanistan, where the military carries out airstrikes daily. But when NPR recently asked Gen. David Goldfein, the Air Force chief of staff, if Air Force capacity was keeping up with the demands it faced, he said: "Actually, it isn't, in many ways. You know, we have, you know, far more mission than we have Air Force today, which is something that we're dealing with." The Air Force now has 1,200 pilots flying unmanned aircraft — its largest single category of pilots — and yet the demands keep growing, Goldfein said. "We have struggled over the last several years to stabilize this [pilot] community because the demand signal has been so great," he said. "In many ways, it's become the oxygen the joint force breathes, right? If you have it, you don't think about it. But if you don't have it, it's all you think about and you want more of it." 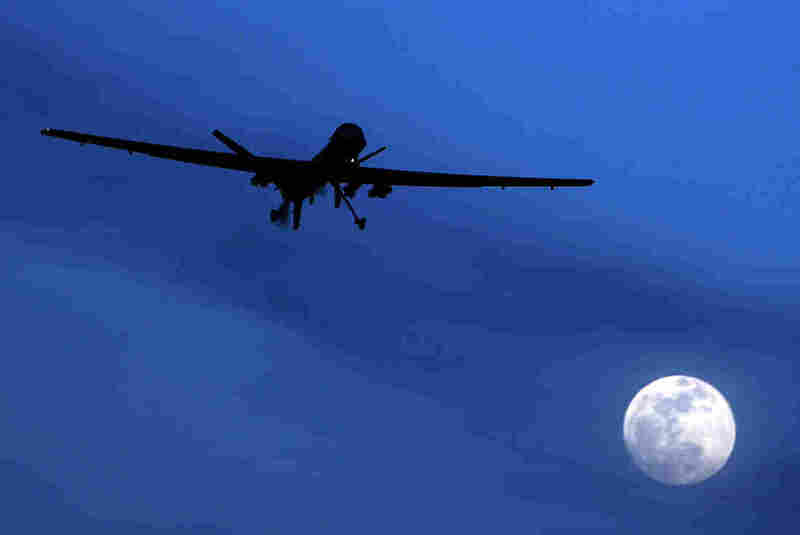 While drones are a potent weapon in striking key targets, they have not been decisive in resolving wars. "The U.S. government persists in thinking it can solve complicated political problems through air power, and especially through 'targeted assassinations' in distant lands," Harvard professor Stephen Walt writes in Foreign Policy. He argues drones can be useful in some limited instances, like pushing back the Islamic State in parts of Libya, though not as a comprehensive approach in places like Afghanistan or Syria. "But because both the Pentagon and the CIA are committed to these tools, and because they give presidents a cheap way to 'do something' without putting a lot of boots on the ground, this reflexive response to messy problems in faraway places is becoming another bad habit," Walt argues. Both Hillary Clinton and Donald Trump have indicated they would continue the current wars, possibly with greater force. "I think we know that Hillary Clinton will probably be a continuation of the strategy we have now, perhaps more muscular," says Warrick, the Washington Post reporter. "She's known as a bit more hawkish on foreign policy. She wants a no-fly zone in Syria to protect Syrians and protect refugees and also Syrians who are fighting on our side. She's wanting to do things quicker, pick up the tempo." Trump hasn't offered detailed plans and his foreign policy pronouncements have ranged widely. He's critical of the U.S. interventions in Iraq and Libya, but also promises tough action against the Islamic State. Congress, meanwhile, gave President Bush the right to use military force against those responsible for the Sept. 11 attacks. President Obama is still relying on that 15-year-old measure for the current wars, though much of the focus is now on the Islamic State, a group that didn't exist in 2001. Northern Alliance soldiers, aligned with the U.S., watch as American warplanes drop bombs on the Taliban on Nov. 19, 2001, around the city of Kunduz, Afghanistan. The U.S.-led coalition quickly drove the Taliban from power, but 15 years later, the Americans are still helping the Afghan army battle the Islamist radicals. As the wars have dragged on, Congress has grown increasingly reluctant to formally take a position. The most glaring example is Syria, which the U.S. has been bombing for two years without Congress weighing in. And that 2001 measure, the Authorization for Use of Military Force, was invoked by the administration just last month to justify airstrikes against the Islamic State in Libya. Congress didn't object, even though its brief resolution was written 15 years ago and directed at different groups operating on a different continent. "Americans increasingly treat the military as an all-purpose tool for fixing anything that happens to be broken," writes Brooks. "Terrorists and insurgents in Syria are beheading journalists and aid workers? Afghanistan's economy is a mess? The Egyptian army needs to be encouraged to respect democracy? An earthquake in Japan has endangered nuclear power plants? Call the military."